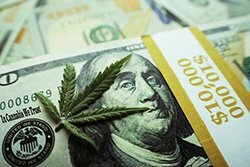 Yesterday, Planet Fitness Inc. (NYSE: PLNT) released its first earnings report since Planet Fitness stock hit the market last month. The gym chain surpassed projected top- and bottom-line estimates. Planet Fitness posted a profit of $11.5 million, up from $8.8 million a year ago. It reported earnings per share of $0.13, just above the FactSet Research Systems Inc. (NYSE: FDS) estimate of $0.12. The company raked in $79 million in revenue, beating the $77.1 million estimate and $62.7 million reported in Q2 2014. In the earnings report, Planet Fitness said it added 38 new locations during the second quarter. That brings the total number of stores to 1,014 as of June 30. 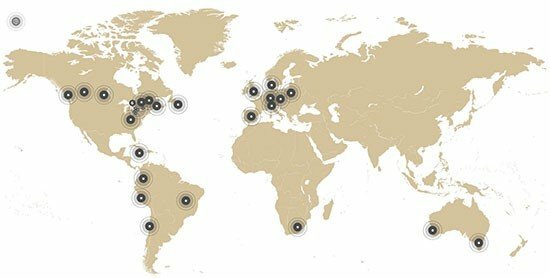 "We view Planet Fitness as a unique growth story with a best-in-class franchise model that points to double-digit store growth," wrote Credit Suisse analyst Seth Sigman yesterday. The Planet Fitness stock price has seen tremendous growth during its short time on the market. 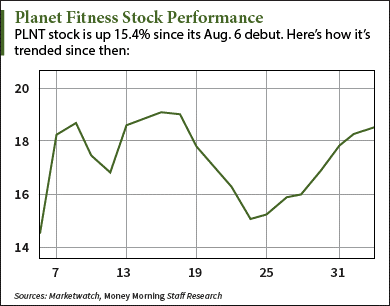 Shares have gained 15.4% since the Planet Fitness IPO on Aug. 6. Should I Invest in Planet Fitness Stock Today? With an ambitious expansion strategy and growing membership of more than 7 million customers, Planet Fitness stock could be a healthy investment down the road. But we recommend holding off on buying Planet Fitness stock until after the IPO lock-up period ends on Feb. 2, 2016. The IPO lock-up is the period of time after a company goes public in which inside investors like hedge fund managers and venture capitalists can't sell their shares of the stock. It can last anywhere from three to six months after an IPO. After the lock-up period ends, these investors sell their in-demand shares to retail investors like us and turn a quick profit. That causes us to buy in at an inflated price and miss out on the big gains the wealthy Wall Street investors already snagged. Etsy Inc. (Nasdaq: ETSY) perfectly illustrates this skewed IPO process. The online marketplace company returned 87.5% on the first day and was considered one of the most popular IPOs of 2015 when it hit the market. Since then, ETSY stock has plummeted 54.1% and is considered the worst IPO of the year. That means any retail investor who jumped in at those elevated prices is looking at hefty losses. Waiting until the end of the lock-up is just one way for retail investors to safely play the tempting IPO market. Alex McGuire is an associate editor for Money Morning who writes about initial public offerings. Follow him on Twitter at @AlexMcGuire92 for the biggest IPO updates.